So I was already aware of what an Omiyage (お土産) was before I came to Japan, (thank you books!) But is appears that after my last Instagram post and chatting with a few people this idea is not well known. First of all, and Omiyage can be very loosely be translated to a Souvenir or a gift. But is is so much more than that! 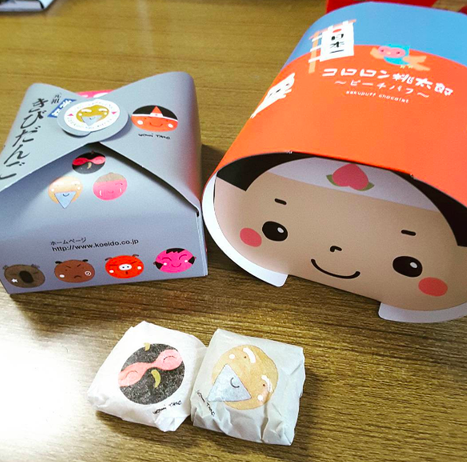 An omiyage is a gift or souvenir you give to friends, coworkers, and family after returning home from a trip, even if it is just to the neighboring town. Omiyage is so much more than just an edible souvenir, though. Omiyage can be identified by the brightly colored and detailed boxes that contain individually wrapped snacks, which are perfect for sharing. Even as a foreigner I am expected to follow this cultural obligation of gift giving. For the other teachers at the school I will be teaching at I purchased a lot of small chocolate bars from my university that have my university logo decorated on the wrapper. And then you can see from my photo (right) there are two boxes that are Omiyage that I bought as gifts. (One was for me I’ll admit). I purchased these Omiyage for the trainers that are training me how to do my job because I traveled to another town to visit on my day off. Know there seems to always be a debate, mostly among foreigners, about what is a good Omiyage. Truthfully, it can be anything as long as it represents the place you visited or came from. A food or snack item is preferred and is the easiest. But you may also consider small items such as reusable bags, key chains and etc. but be careful of spending too much. Again, adding to the difficulty of Omiyage if you spend too much on the item then you will burden the recipient. My suggestion if you are buying individual items do not spend more than ¥100-300 per person and then if you purchase a Omiyage box gift then (I personally) don’t spend more than ¥700-800. If you have not noticed Omiyage are tricky but you can do this! If you have every received or have given an Omiyage let me know about it! The perfect gift for someone with a goal! Are you still going around to buy omiyage? You are out of trend!